AllegroMedical.com presents The Silent Call Smoke Detector with Transmitter. Very simple to install battery powered photoelectric smoke detector from Silent Call, with built-in transmitter. 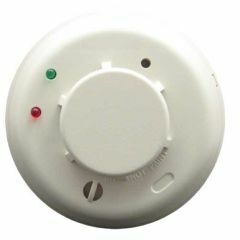 If the smoke detector is "set off" the transmitter sends a signal to any 318MHz Silent Call receiver. Sends a signal up to 250 feet away depending on the receiver used. Battery operated - uses one 3V lithium battery (included). Three year warranty on smoke detector and five year warranty on Silent Call transmitter board. Wow, super fast delivery. We needed the product ASAP and we sure got it fast. Thanks very much - will use you again.